Hacking podman to have "rootless" routable ipv6 containers using a small root daemon. Podman is great, but to have it replace our current docker setup it also needs ipv6 support (which it has using slirp4netns), but this isn't reachable from other containers or outside the host. We don't care about incoming legacy IP (ipv4). Podman tries to create a user namespace, join this and become root in it and re-executes itself in that namespace. We need to save the id of the executing user somewhere, the environment looks a good place. So we create a v6pod_user variable which contains the userid of the user running podman. This could be added somewhere better probably, but I kept it in the same method. We don't have access to the container PID yet there because it hasn't started, but we already have the container ID that will be used. So I save the container ID in the v6pod_id environment variable. 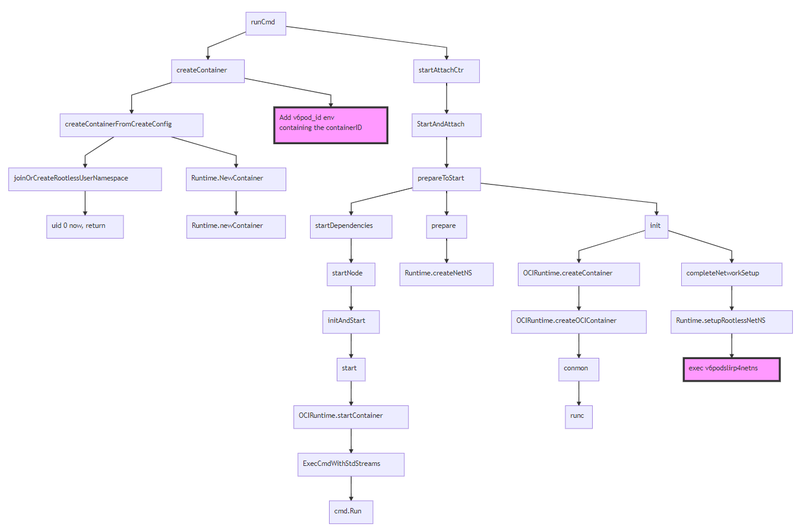 Overview below of what happens when podman runs executes again but now in the user namespace. We could've set this using another variable, but to be more flexible (maybe we need more information about the container in the future) we choose not to. 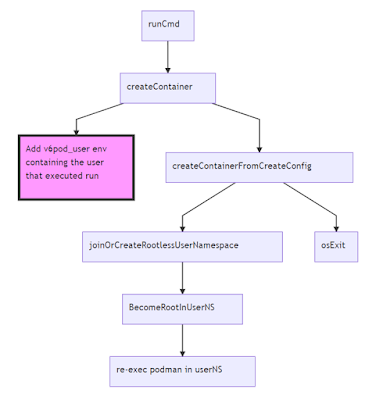 Podman saves it create-config in the path: "/run/user/" + userID + "/libpod/tmp/socket/" + containerID + "/artifacts/create-config" which contains a lot information and also the container name. So we use the variables we set above to do all the networking stuff we need, then let slirp4netns do it setup so we still have outgoing IPv4 besides IPv6. When the container ends, slirp4netns exists and we do a deregistration. slirp4netns sets an ipv4 and ipv6 address and gateways. We do the IPv6 part now, so this needs to be disabled in slirp4netns. v6pod is a go daemon with a rest interface that has a /activate and /deactivate entrypoint. Our current solution uses Jenkins to start a Nomad job which starts a (unprivileged) docker container in which a developers Dockerfile is being build (as root) using the docker on the host. The goal is to replace the docker build in the container by buildah so that we don't need to make the docker on the host available inside the container. The path to this wasn't as straightforward unfortunately, a lot of yaks needed shaving. Out of the box running buildah in the container will give an overlay error. 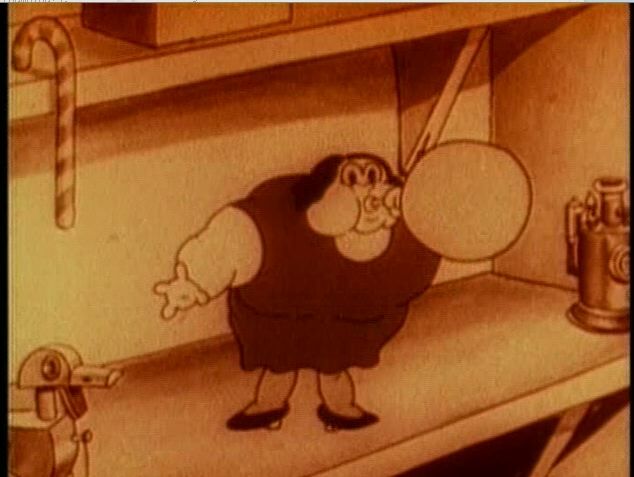 # buildah bud -t test . ERRO 'overlay' is not supported over extfs at "/var/lib/containers/storage/overlay"
Spoiler: The real reason this doesn't work is because it tries to do a mount call, which can only be done with the SYS_ADMIN capability (or in a privileged container). Using --storage-driver vfs fixed this problem. # buildah --storage-driver vfs bud -t test . After some googling I found that centos/rhel kernels have user namespace disabled by default and need to have a kernel parameter set to get this working. sudo grubby --args="namespace.unpriv_enable=1 user_namespace.enable=1" --update-kernel="$(grubby --default-kernel)"
And come to the conclusion that it still doesn't work. Thanks to the #buildah channel on freenode, I found out that the problem of yak 2 was actually an outdated buildah version. Centos has only a buildah 1.2 rpm, but 1.4 or higher was needed so I'd have to build my own. You can have this pleasure too with the following script containing a modified RPM spec. Progress, a new error when running buildah 1.4! container_linux.go:336: starting container process caused "process_linux.go:399: container init caused \"rootfs_linux.go:58: mounting \\\"/proc\\\" to rootfs \\\"/tmp/buildah596035765/mnt/rootfs\\\" at \\\"/proc\\\" caused \\\"operation not permitted\\\"\""
Again thanks to #buildah channel, I found out that running --isolation chroot would solve it. Finally it works, we have an image created by buildah running in an unprivileged container. # buildah --storage-driver vfs bud --isolation chroot -t test . But after testing a new yak appears. This one is related to yak 1, because we're using the vfs storage driver, it uses the disk not very space efficient (according to https://docs.docker.com/storage/storagedriver/vfs-driver/) a more complicated docker build uses gigabytes of disk when using the vfs storage driver compared to the overlay driver. To run with the overlay driver we need access to the mount call which means we have to run our docker container with CAP_SYS_ADMIN which is unfortunate. It's possible to run buildah in an unprivileged container but only using the vfs storage driver, but beware of the disk usage when building images! https://kinvolk.io/blog/2018/04/towards-unprivileged-container-builds/ an overview of what's the problem and what's getting fixed regarding to unprivileged builds, must read! Consul 0.5.2 has some issues running such a setup, but if you're building consul from master (which includes some fixes (see https://github.com/hashicorp/consul/commits?author=42wim) it will work fine. the IPv4 version of consul listens by default on private address ranges, when using IPv6 you'll be running on 'public' addresses. So be sure you're firewalling those from the internet. Not IPv6 related, but for extra stability, enable leave_on_terminate. The consul server are running as a docker host mode container (which means, they share the same network namespace as the host). The reason here is that we need a fixed IPv6 address for the servers because we're forwarding our dns requests to those servers. (ofcourse with some extra work we could make a script that dynamically update our dns forwards to the dynamic IP address). You'll need to cherry-pick this PR into your local build: https://github.com/hashicorp/consul/pull/1219. 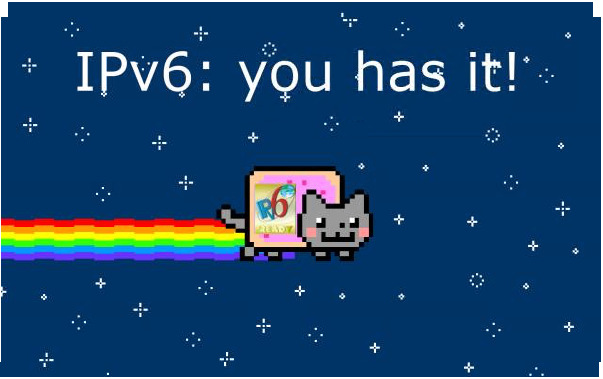 The IPv6 address in the docker container will be random and we want to bind to the IPv6 address. This patch looks for the first 'public' IPv6 address and uses this address to advertise. bind :: actually binds to IPv4 and IPv6 addresses in the container, but because we advertise the IPv6 address the IPv4 address won't be used. We also use registrator to register our services in consul. So every time a container starts or stops, registrator handles the consul service registration process. Because we're running consul on IPv6 this means registrator also needs to connect to the IPv6 address. Registrator then can register other services that are running on the docker host, like e.g elasticsearch. Besides main registrator we also run registrator-netfilter which automatically firewalls the IPv6 services in the container. The containers are no longer NATted but directly accessible, so they need to be firewalled. ES is also run ipv6 only, using registrator, registrator-netfilter and consul. All was well for a few months and I was replacing screen with tmux everywhere. It did have some other niceties besides working in containers and seem to do its job. Notice anything special above ? Compare it with screen. So, tmux seems to be using an awful lot of memory. Two times more than screen, for a 'lighter' session setup. My first thought was, 'memoryleak', so I checked the code, but everything seemed to be free'd correctly. I joined the #tmux channel on freenode for some help and got told that it's a specific glibc (linux) issue. Although the memory was free'd, Glibc wasn't releasing it back to the OS. But you could force it by using malloc_trim(0). And maybe you could use specific glibc environment variables to control memory allocation behaviour to also emulate malloc_trim(). Too much time googling and testing was wasted, I couldn't get it too work, the memory wasn't getting released back to the OS. I tried to get this patch into upstream tmux, but was told: 'It's up to glibc to decide how malloc works'. Rancid lovers rejoice, a 3.2 alpha version is released with (at least) 2 interesting features. - Git support: based on the patch by jcollie. But with a 'small' difference, not one repository for all the groups, but a repository per group. Maybe fine if your starting from scratch, but for my situation I like the one repository setup of the original patch. - WLC support: Now you can backup your Cisco Wireless Lan Controllers configuration out of the box. One patch less to maintain. Hurrah! I'm running Rancid in a Docker setup, so upgrading and testing was quite easy. No issues found yet with this version. Unless you've been living under a rock, you'll be aware that IPv6 usage has been increasing. Yes, it even has come to this: mere mortals can use it at home. The audacity! Unfortunately not all vendors (if any?) have feature parity, in our case a specific VPN product doesn't support IPv6. The client will only receive an IPv4 address from the VPN server. 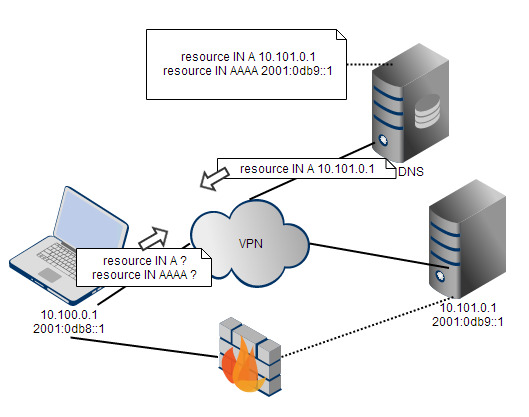 When the user at home starts it's VPN and asks for an internal resource (which also has an IPv6 address), it will try to connect to this resource using the IPv6 from his provider (he didn't receive one from the VPN server) which doesn't work, because this specific resource is firewalled for outside addresses. Luckily we're using PowerDNS recursor which has support for LUA scripting which can modify DNS responses. The script below gives normal answers to every host not coming from 10.100.0.0/15 or 10.0.0.1/32. Otherwise if the answer contains an AAAA, drop it, and return the rest. 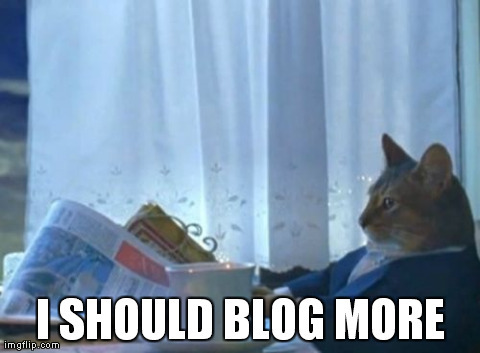 Which means I have some more time, expect some IPv6 and Cisco related posts in the near future.